Marcia here today to share a card I made for my sister's upcoming 50th birthday. I altered the chipboard alphas using my Quick Quotes Powderpuff Inks and now they match my paper perfectly. Take another look at your chipboard alphas and give this technique a try. Love the card and the use of chipboard numbers. 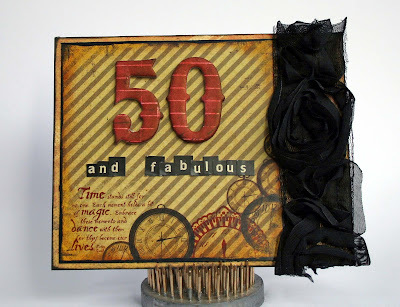 Love how you altered the chipboard with stripes to match the paper! Great card. Really like how you altered the chipboard. Bet she loves it! Love the card! I would not have thought to use the flowers in that way. Thanks for the inspiration! Beautiful card! Perfect for such a monumental birthday! Fun card and so cute with the black roses. Love the quote. Like the chic/glam look the ribbon adds to this. Perfect paper for this 50th birthday card!